Hi all! This is a project I've been working towards getting up and running for a couple years while I learned Stencyl/game development in general. It's something I've always dreamed of making, and I'm so grateful for Stencyl for having such an awesome and intuitive workflow that made it feel possible! 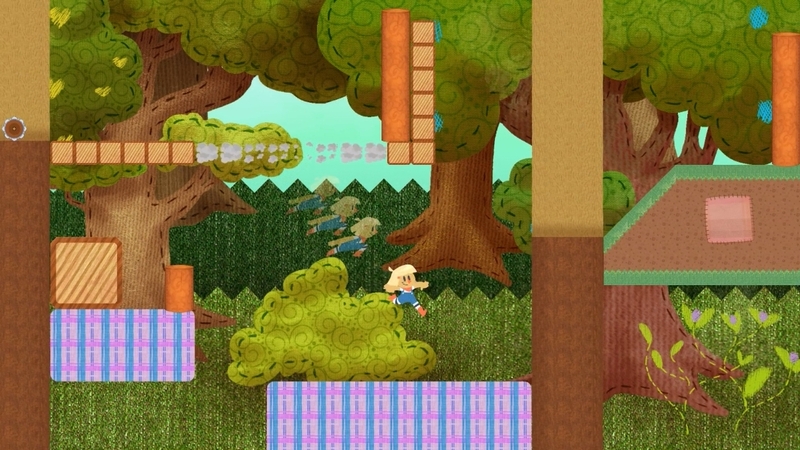 It's a platformer where the focus is grappling onto objects and enemies and launching off of them. This can be used for reaching places, ricocheting off walls, breaking blocks, and more! I've got some cool ideas for future mechanics as well as expanding on this one. Breaking some blocks by launching into them! You can run fast too after you've launched off something! Now that the game's in a state where I feel comfortable sharing it, I'll try to keep this thread updated with major developments! You can also follow development on twitter if you like. I have some really talented friends doing the art; you can find their twitters listed on the game's twitter. My current game plan: getting a demo of the first area out in October. The game will have ~5 areas total. I'm planning (perhaps a bit too optimistically considering how unexpected developments always pop up in gamedev) of finishing the game around this time next year. Here's hoping! Feel free to leave criticism if you have any, and thanks for being an awesome community! I haven't posted much up to now but I've been following some journals and I consult old threads for help constantly. Thanks for checking out my game! Really cool, love the atmosphere you have created. Kind of gives me some Micky Mouse Castle of illusion vibes mixed with a bit of sonic. Some feedback purely based on the video is its maybe not obvious what objects you can run through and what you collide with, but maybe thats not an issue when you are actually playing it. Looks really smooth controlled.Also the mechanic of changing jump mid-air is really cool. Great start and best to you on the project! Thanks for the comments! Yeah colburt and mdotedot, I definitely see what you mean about readability, especially with those fabric-looking platforms. 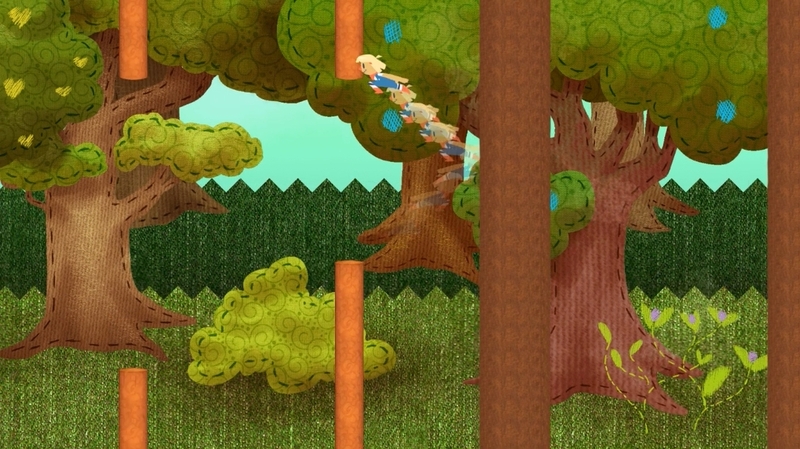 I implemented those in kind of a hurry to make the video more presentable and it shows, haha. It's not super clear if they're solid or if you can land on them, and they don't blend super well. Definitely gotta workshop those! I've been hard at work on the game since the last time I posted here. One major thing I've corrected is areas where the collision wasn't too clear. Thanks for the comments on that! The main character's animations are also much clearer, before it wasn't quite getting across with the gameplay that she was latching onto stuff by grabbing on with a pitchfork. Those things she's hitting will have spikes so it's clear they're not something you can grapple onto, like with other stuff in this game. She can hit them into blocks to break them! This is an NPC! His name is Bobby! I'm currently writing some fun dialogue for him an another couple characters who will be in the game's first area. And finally here's a rat enemy who will pick up coins if you let him! You can get them back by grappling him and launching off, I'll have to make a separate gif to show that off though. 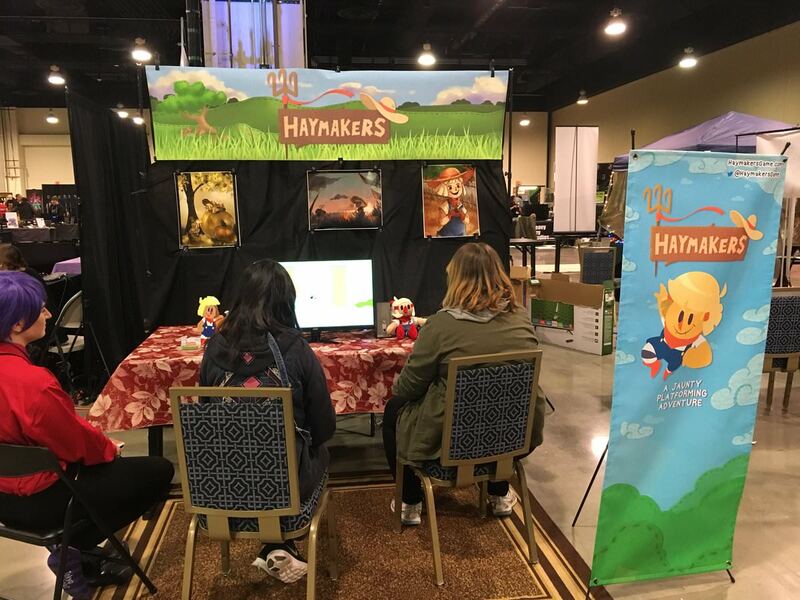 Also I wanted to let you guys know that Haymakers is going to be at the MAGFest Indie Game Showcase in January! It's my first time doing something like that, so I'm pretty excited and nervous! I'll let you know how it goes! I've got other stuff to show off in the game too, but I'll try to space it out. That's what I get for not posting here in a while! MAGFest has been great so far! We've got one more full day of showcasing. 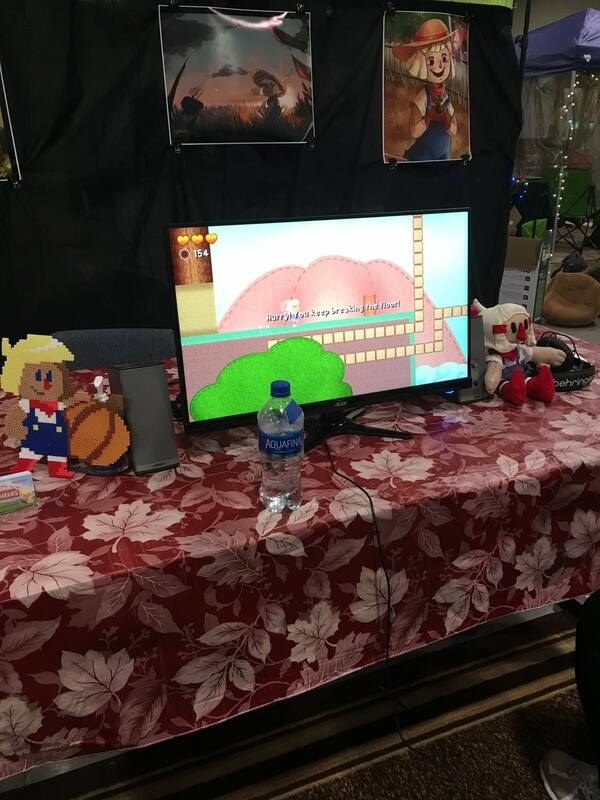 We've gotten a lot of players and positive feedback over the previous two days and I even got to tell a few people about Stencyl! I'll write more and share some pictures once it's over. The long and short of it: it's so stressful but so rewarding. Just like gamedev! So we're back from MAGFest! It was an amazing experience and I'd totally recommend applying to showcase at it or cons like it if you've got the funds and some helping hands. It's pretty close by where I live, so it wasn't too difficult to drive there with all the supplies we needed. I won't lie, it cost us a pretty penny to buy all the equipment we needed (and we only had one computer/monitor set up, most people had two!) but we had a beautiful booth. Great location too, it was about in the middle of the expo hall and in front of a lot of foot traffic. Reception was fantastic! We rarely had a moment when someone wasn't playing the game. Lots of people would stop by and watch the game being played, and a good number of them would stick around to try it themselves. Got lots of positive feedback, criticism, and people experiencing bugs, lol. Oh yeah, it was both terrifying and extremely helpful to learn about a host of bugs I didn't even know about. But hey, it's like having free play testers! Gosh, it was also terrifying just putting the game out there for people to play. It was the first time anyone played it other than myself and close friends and I was so nervous! But so many people dug it! We also met a lot of other friendly developers and did some networking! I enjoyed telling people it was made in Stencyl. Lots of people hadn't heard of it, but I explained that it was an engine with a visual coding system and that I had little coding experience. A couple people seemed interested! There were also a few who had heard of Stencyl, and I got a couple "You can make games like this in Stencyl??" (darn tootin'!) so that was a lot of fun. We also handed out a LOT of business cards and got a nice chunk of people to sign up for our mailing list. Not bad for some exposure! We did do it mostly for fun though, and for the deadline it imposed on us. 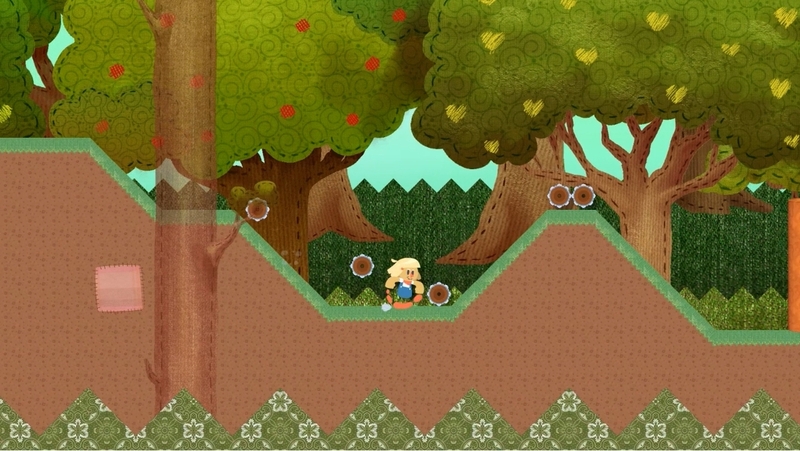 Now the demo's nearly ready to put online for people to play. I just need to spend a few days fixing the issues that I saw people experiencing at MAGFest, haha. So overall a very positive experience! Like I said before, I'd wholeheartedly recommend applying to something like this if you've got the money and a team or friends to help you set up. It was a lot of work, but a lot of fun! Oh man, thank you so much dude!! I'm so glad to hear that! Yeah gosh, I've gotten so much feedback from people and also friends that it's made me want to change so much...despite that I'm happy with progress haha. Yeah though, I'm excited to implement bosses! I've got some clever ideas already! I've been adding every idea I can think of to do with these mechanics to a document so I don't forget. I can't wait to play your game, btw!